If you've ever gone to a hackathon, you've likely encountered a person named Mike Swift. Typically sporting a smile and a SendGrid t-shirt, Swift (who goes by Swift) has been involved with every single one of the ten or so hackathons I've attended. By his count, he's been to something like 150 hackathons. "I cant get away from them," he says. "I just love them so much that it's like, every weekend," he says. It helps that his previous job as developer evangelist for SendGrid required him to be a hackathon groupie, preaching the gospel of SendGrid's API to the hacking masses. But he'd be there anyways. He loves the essence of the overnight hacking marathon session. Where else can you build something cool, for fun, with a bunch of your peers, all while learning things that help you in your job? The events offer a tantalizing combo of networking, learning and experimenting in the name of "why not?" It's a place for coders to test their limits of sleeplessness while just generally being creative, disruptive, brilliant and silly. "They're a perfect intersection of developer needs and values," he says. He's so into hackathons that he built a platform for the events to run on. It's called Hacker League, and it was created, naturally, at a hackathon (HackNY, October 2011). The platform gives hackathon organizers a landing page for their event, a registration form for hackers, a submission page for the finished projects, a database of all the APIs used, voting and judging features, as well as an archive of all the hacks. It functions as the essential hub for the event, and it's a cool little tool to use. That's all Swift thought of it when he built it. But sometime last year, he noticed a shift within the world of hackathons. When Hacker League started out in October 2011, there was maybe one hackathon a month, Swift says. Now, Hacker League has weekends with 17 different hackathons happening at once. Once limited to universities, community groups and startups, hackathon events have become hot tickets for large media companies, ad agencies and corporations. Hell, even Fashion Week hosted one earlier this year. These private events represented an opportunity. To capitalize on that shift, Swift and his co-founders developed Hacker League into an enterprise-level offering. They professionalized it with more features; Swift began working on Hacker League full time in June. Hacker League caught on, showing that corporations love hackathons, too. In hosting a hackathon, they get access to a very valuable and hard-to-reach set of coders. Sponsors get to be associated with a cool event. Tech companies whose APIs are used get product feedback. And the whole thing serves as a subtle recruiting play, too. All told, Hacker League hosted more than 450 hackathons on its platform, including giant ones like TechCrunch Disrupt, PennApps, and HackNY. In the process of doing that, Hacker League caught the eye of the people behind Mashery, the API infrastructure company which sold to Intel in May for $180 million. This week, Swift announced Mashery (and parent company Intel) will buy Hacker League for an undisclosed amount. Swift will help transition the product, but will not be joining Mashery. "We didn't even come close to realizing the potential of what's there," Swift says. His hope is that Mashery, which has a strong reputation amongst the hacking community, will be able to do that. 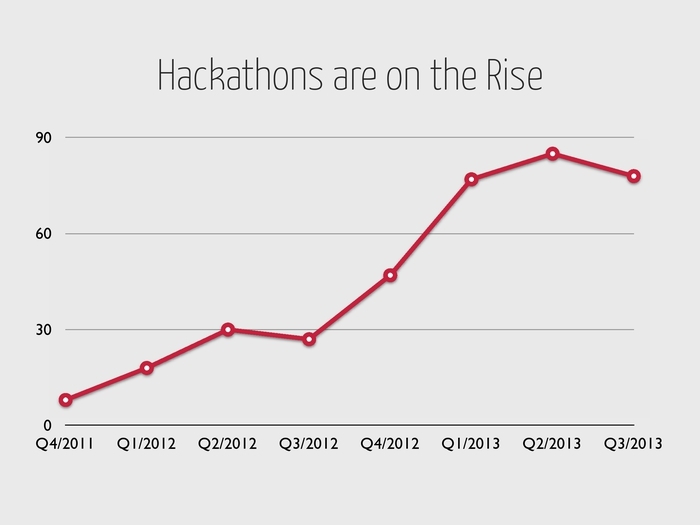 So why does Mashery want a hackathon platform? Well, the company already has a presence at more than 60 hackathons a year. Many of their customers are throwing hackathons and could benefit from Hacker League's platform. Hacker League plays at the intersection of developers, APIs and event organizers, which are three groups that Mashery wants to be close to. As for Swift, he'll still be a regular at hackathons, even after he transitions out of Mashery. He recently built a platform called Major League Hacking, which ranks schools on how their hackathons perform. (Princeton Maryland won the Fall season.) Surprisingly, it wasn't built at a hackathon.